Haha great chapter btw. Loved this: “Last time I checked, I was married to your sister, not you” Harry replied. “You wound me,” Ron said, clutching a hand to his heart. Made me giggle. And Teddy morphing to look like a mix between Sam and Dean? Both completely awesome and really sad. Well done! It's either going to be one or two more chapters, then there will be an epilogue-esque timestamp at some point after that. Then...well, then we'll see. But yes, seeing as how I had originally planned to finish it in October, you've already got two more months out of it than I originally intended! i so wish that i had the artistic skills to make a pic or icon of the winchester coat of arms, it would be epic! and another very cool chapter! Yes, I am nearly done! Only one or two more chapters to go, and then a timestampy-epilogue. Then I'll have free-time for the first time in 9 months. lol this already IS a sequel!! Other than that, as of right now, beyond maybe a timestamp or two, I don't see myself writing another epically long story in this 'verse - but, you never know. I knew Harry would take them to Firenze as soon as he decided to take them somewhere. I wonder what he'll say? Well, similarly to what Lisa told Dean in S3 - Teddy might not have survived without them, so in a way, they kind of have children - just not biological ones. I'm glad you liked the chapter :) Thanks for reading! My fingers are crossed! o_O Last chapter? ...Does that mean there's going to be another sequel? XD Here's to hopeful thinking! 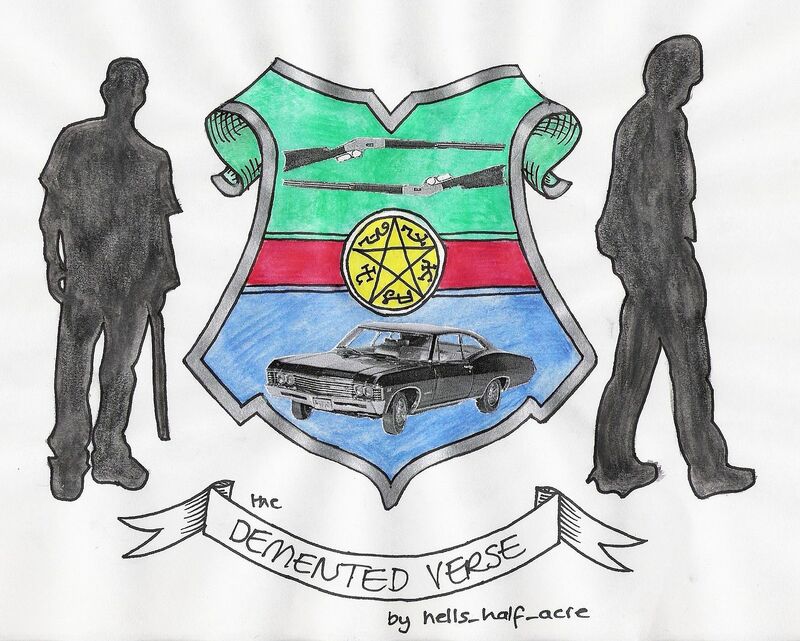 LOVE the Winchester flag/coat of arms thing and ABSOLUTELY ADORE how Teddy shifted into a mix of Sam and Dean. *swoons* Everybody is just so PRECIOUS! This already is a sequel! :P As of right now, I do not plan to write another epically long story. There will be at least one timestamp, with option of more short timestamps...but I am all storied out! It seems I have a thing for precious children, which really makes me laugh because IRL I can't really stand kids. :P Teddy though - I'd adopt in a heartbeat. Thanks for the update, I'll be keeping my fingers crossed :D It's so nice to see Sam and Dean being honoured and respected for what they've done, and I love the idea of their own personal coat of arms. I figured Sam and Dean needed to be honoured for once. I'm glad you liked it. The coat of arms was a fun thing to picture in my head. I figured you were going to have a feast, but such an overt celebration of the Winchesters assistance including a coat of arms (and an appropriate one for these two men) and cheering was lovely. I enjoyed the light-hearted feel during the meal especially with the change in demeanor for Ron and the nostalgia over celebrating Hunters. I really like how you have used Teddy throughout this story and this chapter is no exception. Having him add Dean and Sam to his repertoire of looks was a great touch. I also love how he defused Harry's melancholy. You are really taking the Winchesters on a tour of the Wizarding World, aren't you? Centaurs? With this possibly being the second-to-the-last chapter, I am feeling sad because I would love to see Castiel and Draco again. Will this be the end of any further stories? I know this all has to come to an end at some point, but I find I am a "I would love to read more" sort of gal if the writer is so inspired. I'd love to see more of Castiel and Draco too, but sadly, the main plot is over - Castiel's back on his search for God, and Draco is keeping to himself. This is the last of the epically long stories - or at least, the last for the foreseeable future. I've introduced Harry to Hunting, and the Winchesters to Wizarding (oh, alliteration, how I love you), and so I have no plot ideas for a third epic. There will be time stamps of course. One I'll write as soon as I finish the last chapter for this story, which will take place after Lucifer's defeat - and then possibly a timestamp when the Winchesters go to Scotland to find Crowley's bones (but no idea when that one will get written). I may do a couple of alternative POV retellings of certain chapters, but I haven't decided. I'm glad you've enjoyed the story so much to want more though! I'm happy that you like how I've used Teddy. :) I really like writing Teddy (not sure if you've noticed). oooh firenze! i love him. and teddy gets more adorable every day. its been and amazing ride, and i really dont want it to end. Two chapters left max - possible just one. I'm trying to decide (and sadly, it's not just a question of how many chapters people want. It's a question of how I want to tell the story). I'm glad you've been enjoying this journey with me though and that I'm your exception! It means a lot, and I enjoy hearing from you every week as I go. The talk Teddy gave Harry was pretty grown-up. Mature. Good kid, that boy, and the part about loving to have Harry as a godfather made me again a little teary-eyedd, especially since my godmother died Monday and I think I'm gonna miss her a lot. I'm curious about the centaurs - and if Dean can hold his patience. I don't know about those, never read that books where they appear. Sorry for missing the update, but I had work to do ;-) My fingers are so crossed, it hurts. Centaurs appear in Book 1 and Book 5 predominately, and then have a brief appearance in book 7...to my memory anyway.